The South African Bureau of Standards (SABS) has set South African National Standards for different categories of wood to ensure wood remains protected against parasites and is thus suitable for intended applications over long periods of time. The minimum CCA levels required to preserve timber for 20 years are shown in Table 1. A pale darkish green colour is left on wood freshly treated with CCA, depending on the type of the wood used and the age of the wood.8 At the end of its intended use, such wood waste may, however, become indistinguishable from untreated or differently treated wood. Informally operating caterers usually buy their fuelwood from suppliers. Caterers need fuelwood to braai meat, boil chicken and sheep heads, and to prepare African beer. Various types of wood are used. Food preparation methods that put the smoke into direct contact with the food, especially braai-ing, generally rely on harvested timber, reportedly because using treated timber has a negative impact on the taste.3 Waste timber is more often found in the supplies of caterers who boil their products; this timber sometimes has a distinct green tint that makes it easily identifiable as probably CCA-treated. We collected wood samples in three Cape Town townships. - Langa, Nyanga and Khayelitsha - and three townships of the Cape Winelands - Zwelethemba (Worcester), Mbekweni (Paarl) and Kayamandi (Stellenbosch) - during three different campaigns. In the first campaign, a member of the research team visited Nyanga and Khayelitsha in October 2010 and randomly collected wood samples destined to be used as a fuel source by informally operating caterers. Some 250 samples were taken, from the top, middle and bottom of fuelwood stockpiles. Of these collected samples, 55 from Nyanga and 31 from Khayelitsha were randomly selected for further laboratory analysis as per the methods discussed below. In February 2011, a ground pole with a dark green tint was noticed in a fuelwood stockpile in Kayamandi (Stellenbosch). The discovery of this suspicious looking specimen made us think of a second campaign in peri-urban areas. The second campaign started in March 2011, making use of purposive spot sampling, taking only fuelwood samples for laboratory analysis if they appeared to have been CCA-treated. A total of 11 samples was collected from Zwelethemba (Worcester) and Mbekweni (Paarl), both from houses and from caterers' fuelwood trolleys. The samples were planks, four of which showed the characteristic green colour, and were stored separately. The Stellenbosch specimen was combined with these 11 samples as being representative of suspect fuelwood from a peri-urban area. Once analysis of samples from the first two campaigns was completed, we conducted a third sampling campaign in both urban and peri-urban areas. In June 2011, 18 samples were purposefully collected based on their suspicious appearance, from most of the areas sampled before. Worcester and Mbekweni were not revisited but Langa was also sampled as an urban area. In each case, all samples were labelled to record where they were collected from. In all the study areas the residents and caterers were asked what type of wood they use, what they use it for and from where they source the wood. To develop a better understanding of CCA timber treatment, we visited the factory of Timber Preservation Services (TPS) in Epping Industria. An indicative concentration of CCA solution applied to wood was obtained from the TPS Manager (on 5 February 2011): 140.2 g/kg, 91.8 g/kg and 135.3 g/kg of Cr, Cu and As, respectively. 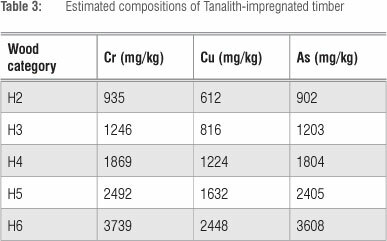 The Cr, Cu and As concentrations in wood after Tanalith impregnation could thus be estimated, as presented in Table 3, for each of the standardised treatments (shown in Table 1); the density of the wood was assumed to be 900 kg/m3. It was noted that the Tanalith Cr:Cu:As ratio (1.5: 1: 1.4) is in agreement with what was reported,13 as nominal values of 3120 mg/kg, 1840 mg/kg and 2800 mg/kg of Cr, Cu and As, respectively. The ratio corresponding to these nominal values is 1.6: 1: 1.5. Both ratios are similar to that of CCA type C (1.7: 1: 1.5), as shown in Table 2. Care needs to be taken when working with CCA-treated timber. Gloves were worn whenever suspect timber samples were handled, and dust masks and extraction facilities were used when working with fine powders. To prepare analysis samples from collected fuelwood specimens, it was necessary to obtain a representative chip sample up to a depth of 40 mm. Samples were repeatedly bored using a drill press equipped with a 15-mm-diameter jagged tooth bit (or hole saw). The area covered was 100x100 mm, whenever possible, allowing for about 45 holes to be bored; if a specimen was too small to accommodate this area, the entire surface was bored. The collected chips were then milled to a free-flowing powder form with 100% less than 0.25 mm using a ball mill. All the sawdust samples were kept in clean plastic bags and labelled accordingly. The moisture content of the samples was determined using an OHAUS MB45 Moisture Analyzer (Ahaus Corporation, Pine Brook, NJ, USA). All metal concentrations reported here are on a dry-weight basis. An amount of 0.25 g of each sample was microwave digested in 10 mL of 55% nitric acid according to EPA Method 3051.13 The mixture was then diluted to 25 mL with ultrapure water. A MARS Xpress closed vessel microwave digestion system (CEM Corporation, Matthews, NC, USA) was used to digest the wood samples. The system consists of a compact terminal touch screen display with operator selectable 0-1600 W output, temperature control up to 240 °C, pressure control up to 800 psi (5500 kPa), a layer-PTFE coated microwave cavity, HPR/ 1000/10S rotator and twelve 100-mL Teflon vessels. The conditions during digestion are shown in Table 4. As a result of the large number of samples necessitating prior use, the vessels were soaked in a mixture of nitric acid and hydrochloric acid overnight to prevent contamination and then rinsed with ultrapure water at least three times. All the samples were successfully digested and the resulting solutions appeared light green. After cooling to room temperature, the sample digests were transferred to 25-mL flasks and diluted to the final volume using ultrapure water, whilst shaking lightly. After shaking, the green colour disappeared and the samples became light and clear. This dilution was performed in a fume cupboard. The samples were then refrigerated at 4 °C until analysis. Analysis was by inductively coupled plasma (ICP) spectrometry to determine total concentrations of Cr, Cu and As. The analyses were performed with a VARIAN 730-ES ICP Optical Emission Spectrometer (Varian, Mulgrave, Australia). In all experiments, reagents blanks were taken separately. Commercially available standards were used as indicated in the results. 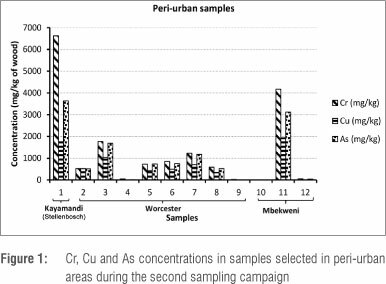 Levels of CCA in the samples collected in the first sampling campaign in Nyanga and Khayelitsha were all well below 5 ppm in the digestate, or 500 mg/kg in the analysed wood. The elements of concern, namely Cr, Cu and As, seemed to be present in most of these samples, at mean values of 13.4 ± 13.5 mg/kg, 5.3 ± 5.1 mg/kg and 7.0 ± 3.5 mg/kg, respectively. These levels are 10-100 times lower than those typical of the lowest dosage of CCA-treated timber (H2). Upon advice from the treatment plants, we decided to attempt a second sampling campaign, armed now with knowledge that treated wood was of a specific functional design and showed a green tint. During the second and third round of sampling, CCA-treated timber was found, supporting the need to use visual inspection during sampling. Table 5 presents a summary of the results for all three sampling campaigns. A statistical interpretation should not be undertaken as the initial sampling campaign was randomly performed without the knowledge of green tinted timber as a visual indicator of CCA presence, whilst in the second and third campaigns only samples that appeared suspect were taken. 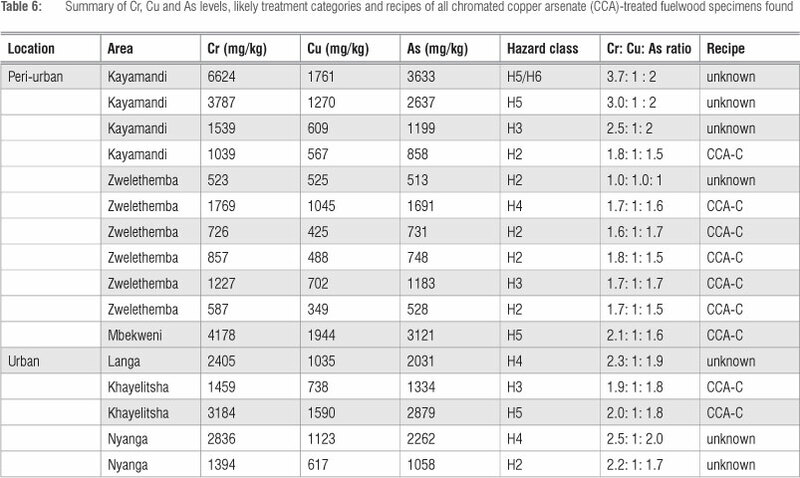 Table 6 gives an indication of the categories of CCA-treated wood into which the 16 samples found to be treated fall, based on the Cr, Cu and As concentrations measured. Six samples were within the H2 category (37.5%), three within H3 (18.7%), three within H4 (18.7%) and four displayed levels typical of H5 treatment (25%). Three of four samples in the H5 category (75%) and one of three in the H4 category (33%) were from peri-urban areas. Based on the Cr:Cu:As ratios determined, it appears that the majority of the 16 samples identified as treated had been subjected to a Tanalith or CCA type C treatment. Two different sampling approaches were used in this study: in the first campaign a large number of fuelwood samples were randomly collected, whilst in the second and third campaigns only suspected pieces were taken. It may appear somewhat surprising that none of the 86 samples tested in the first campaign showed Cr, Cu or As levels typical of treatment, but this campaign was done without the knowledge that treated wood had characteristic appearances and can be identified by the treatment plant catalogue. Later visual inspections of fuel supplies of caterers in urban areas confirmed that 'suspect' pieces are seen infrequently. Sampling theory warns that significant variance can be introduced during sample processing. The focus of this investigation was not a precise determination of metal concentrations in fuelwood, but rather the detection of prior CCA treatment followed by a broad categorisation (in terms of treatment levels H2-H6). As such, we did not have to pay detailed attention to the variance resulting from the sample preparation. The generation of shavings with a drill would have introduced some variance as a result of drilling to different depths - it is likely that CCA concentrations are higher closer to the surface. Further milling to a fine powder should, however, have homogenised the samples well, resulting in the 0.25-g sample ultimately digested being sufficiently representative of its respective timber sample. The analysis method used in this study (EPA method 3051) was performed according to the instructions and no solid residues remained. There was some experimentation with the calibration of the ICP particularly in the first campaign, as the expected CCA concentrations were not yet known. Generally though, for digestate metal concentrations greater than 5 ppm, the error in repeat analyses was acceptable at less than 5%. The standards used in the sample analysis were approved by the SABS. We found wood pallets, originating from adjacent light industrial areas, to be the predominant source of fuelwood amongst informal caterers in Nyanga, Khayelitsha and Langa. The samples collected during the first sampling campaign were small, lightweight samples, easily parted with by the caterer or end-user. Of 100 tested samples collected from these urban areas, only 5 samples contained CCA; these 5 had been part of 14 purposefully selected pieces with a suspect appearance. These wood pallets are actually discarded by industries after re-use and intended for disposal, mainly by breakage as the wood is of inferior quality and breaks when overused. The pallets are not manufactured to last for long and break quickly. Significant quantities of discarded pallet wood can easily be sourced by entrepreneurs or those in need of fuelwood. 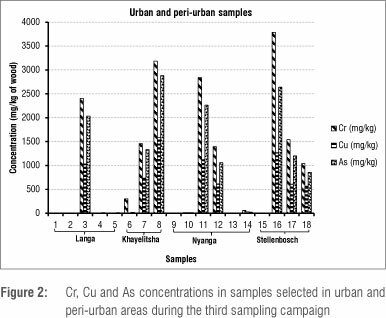 Of the 16 samples collected from peri-urban areas, 11 contained CCA. In Zwelethemba, Mbekweni and Kayamandi, CCA-treated wood used for fuel was reportedly sourced from materials for the construction of low-cost houses, and from fencing initially used for homes and farms that was replaced by concrete walls or metal fences. CCA-treated wood was substantially more frequently encountered in peri-urban than in urban areas. Evidence was found that CCA-treated wood is being used in informal catering activities both in Cape Town townships and in peri-urban areas of the Winelands district. In city townships, the occurrence of such timber was rare (estimated to be of the order of 0.1-1%) and could only be detected by a trained eye as it generally was old timber; even so, only 5 out of 14 suspected samples tested positive for CCA. In peri-urban areas, CCA-treated timber was more frequently encountered in fuel stocks (1-90%), and clearly distinguishable by its colour and young appearance. Given the health risks of exposure to inorganic arsenic and chromium, our findings call, on one hand, for further research to understand more precisely the absorption and health effects of exposure to such treated timber in the Cape Town region, as well as in and around other South African and African towns and cities. On the other hand, action should be taken to limit such exposure risks by introducing regulations for timber users and suppliers. We would like to express our grateful acknowledgements to Mr Romeo from Epping 2 TPS for a factory visit, information on safe handling of CCA-treated timber and quality control information. We also thank Mrs Helen Divey and Suzanna Vasic for analytical support. We are grateful to TWOWS for a fellowship for postgraduate studies. Lastly, we are indebted to the Vice-Chancellor of the University of Cape Town for recognising the alignment of this work with the university's new strategic objectives and the associated financial support. We applaud the volunteering work of the 'caterers' working group of the Engineers Without Borders branch at the University of Cape Town, which has worked to introduce efficient wood stoves to Nyanga-based caterers alongside our research. R.N. collected many of the samples, digested the wood samples and wrote much of the early drafts for this manuscript. S.N. developed the wood analysis methods together with R.N and collected many of the wood samples. M.A.D. 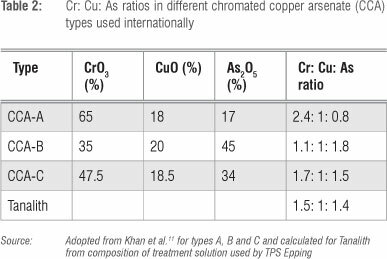 provided guidance as to the health risks of exposure to copper, chromium and arsenic and contributed relevant sections to the manuscript. H.v.B. conceived and directed the project, secured the funding, helped with the interpretation of results and edited the final version of the manuscript.